Protecting workers against the threat of breathing in dusts and airborne particles is essential to remove the risk of them contracting respiratory related illness and disease, such as lung cancer, silicosis, occupational asthma and chronic obstructive pulmonary disease (COPD). Prevention is critical when it comes to respiratory protection and respiratory protective equipment (RPE) is key to safeguarding workers. In many cases, workers without proper protection and exposed to dusts and silicas will not necessarily show the signs of damage or disease until years later. According to the Health and Safety Executive (HSE), there are approximately 12,000 deaths each year in the UK due to occupational respiratory diseases. As these are long latency diseases, current deaths reflect the impact of past working conditions. About 41,000 people who worked in the last year and 147,000 who had ever worked currently have breathing or lung problems they thought were caused or made worse by work (Labour Force Survey). Each year an estimated 18,000 new cases of breathing or lung problems are caused or made worse by work (LFS). Many common construction materials contain silica including, for example, asphalt, brick, cement, concrete, drywall, grout, mortar, stone, sand, and tile. Protecting workers who will come into contact with substances such as dusts and silica is essential as it only takes a small amount of silica dust to create a health hazard. So where workers are exposed to dusts, mists and fumes, the ideal scenario is to eradicate any possible contact between the worker and the dust hazard. Where working practices cannot be changed, it is important to provide workers with the right level of respiratory protection. The most common form of protection is dust masks. 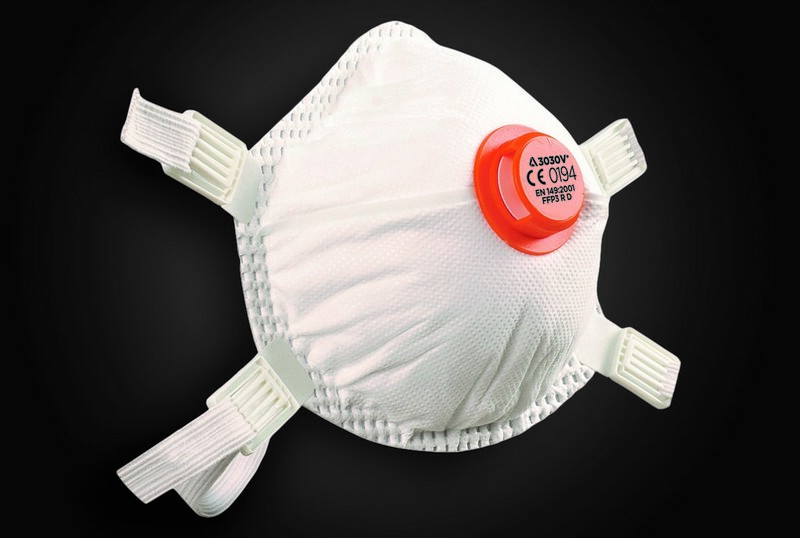 All dust masks and respirators provided for work environments must be approved to the appropriate standard and marked with the latest EN standard, which for disposable respirators is EN 149: 2001 +A1 2009. 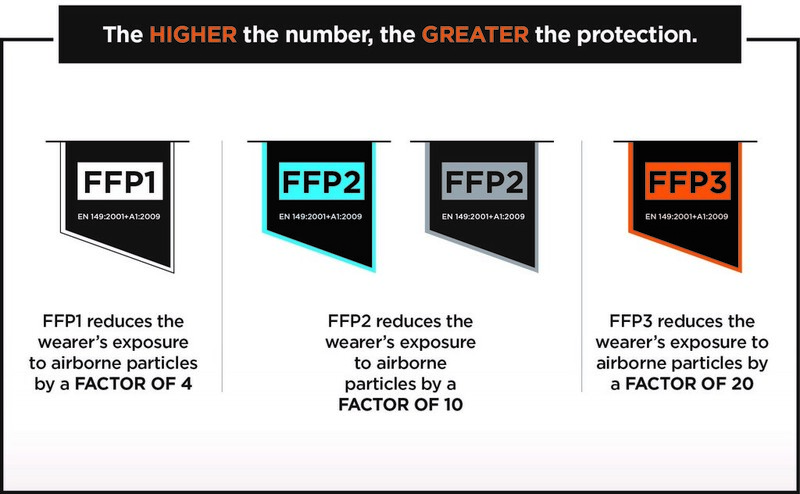 FFP1, FFP2 and FFP3 signify different classes of respirator, offering varying levels of protection to the wearer (assuming they fit properly and are used correctly). FFP stands for Filtering Face Piece. The higher the number the greater the protection. Such respirators are designed to filter out particulates such as dust, liquids and fumes. Even if you have this information, finding a suitable respirator is not simply a matter of choosing a model you like the look of or buying the cheapest. Not all faces are the same and neither are disposable respirators. You might need to try different makes or sizes to find one that fits without leaking around the seal and letting dust in. The only way you can know if the seal is good enough is by having a proper face fit test. Currently this is also the only way of meeting legal requirements. Having worked closely with the BSIF and HSE in the development of a suitable accreditation scheme for Face Fit Testing, Alpha Solway were one of the first ’Fit2Fit’ accredited RPE Fit Test Providers, now recognised within the HSE 282/28 Fit Testing Guidance Notes. The scheme confirms the competency of a particular individual to perform fit testing on tight fitting face pieces. Training in the proper use and care of respirators has been mandatory in the COSHH (Control of Substances Hazardous to Health) Regulations since 1989. The 2002 revision of the COSHH regulations and the Approved Code of Practice (ACoP) now require that fit testing of respiratory protective equipment (RPE) be carried out. Only respirators that are loose fitting and rely on airflow through the device e.g. powered helmets/hoods are exempt from face fit testing. When looking at dust masks, it is important to remember that FFP1, FFP2 and FFP3 are designed to filter out dust, mist and fume only. They should not be used where there is an oxygen-deficient atmosphere or harmful gases and vapours above the WEL.